Nancy Honchen, a wonderfully energetic blogger and creative interior designer, has honored all of us over at Greyson Place by nominating our blog for the 7 Wonders of the Blogosphere awards! Nancy’s blog, Design Secrets, is a great read for those who adore all things design. Her positive spirit paired with her wonderful eye for design makes her blog one you’ll look forward to reading. Thank you, Nancy, for this honor! Make someone’s day! Show your support and appreciation for a fellow blogger whom you believe is a true Wonder of the Blogosphere by following these simple steps. 1. Display the award logos on your blog. 2. Link back to the person who nominated you (what better way to say thanks!). 3. Tell the world 7 things about yourself. 4. Nominate 15 fellow bloggers to receive this award. Be sure to link to their pages! 5. Let these bloggers know you’ve nominated them and link them to your post. 6. Enjoy your awards, you’ve earned them! 1. Greyson Place is the brain child of a family who shares a love of design. What can we say? It’s in the blood! 2. Greyson is our family dog! He is a 5-year-old Italian Greyhound whose passions include belly rubs and roaring fireplaces. 3. Our team of designers travel the country from market to market in the constant search of new and unique products. 4. 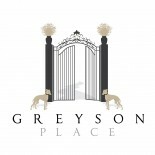 Greyson Place began in a townhouse that is usually host to families of deer roaming the backyard. 5. We are proud New Jersians! 6. Greyson’s not the only family dog! Chelsea, a silky teacup Yorkie, is his little-big sister. 7. Greyson Place would not be here today without the love and support of our wonderful family and friends. Our choices are those who demonstrate true greatness in blogging. Their posts are engaging, the topics interesting, the photos eye-catching and the content uniquely memorable. Check some of them out for yourself and see what you’ve been missing! Congratulations to all the nominees–you’ve earned it! This entry was posted on February 10, 2014 by Kaitlin Wagner in Greyson Place and tagged Awards, Bloggers, Blogs, Greyson Place, Home Accessories, Home Decor.